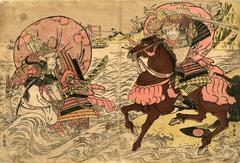 Both combatants are wearing a horo (母衣), a large, billowy-looking attachment at their backs meant to take the blows of arrows and thereby to keep them, to some degree, somewhat safer. One argument against the figure in the water being Atsumori is the mustache. On nearly all other images of this character the young warrior shows no facial hair. So, if it isn't Atsumori then who is it?